When I started my job at Streetsblog San Francisco I had no idea that it would turn out to be the best job I’ve ever had. I really mean that. I often tell people I’ve had more impact in the last two-and-a-half years at Streetsblog than I did in all my 20 years as a radio and TV journalist. That’s why it’s very difficult for me to announce today that I am stepping down as the editor San Francisco Streetsblog, effective September 30, to pursue other opportunities. Back in December 2008, when Streetsblog founding editor Aaron Naparstek hired me, I didn’t know what chicanes and bulb-outs and woonerfs were. I hadn’t read “The High Cost of Free Parking” or heard of Jan Gehl. All I knew was that I was angry San Francisco had a bike injunction that was preventing an expansion of the bike network, and I wanted to do something about it. I was paired with one of the smartest and most passionate colleagues I’ve ever worked with, Matthew Roth, and together with our wonderful team of writers, including the talented Michael Rhodes, and the legendary Chris Carlsson, we built Streetsblog San Francisco into a successful advocacy news site that I’m proud to say has influenced transportation policy in San Francisco. Our stories are constantly sourced by mainstream media reporters, and we have amassed a loyal following of thousands of daily readers, whose intelligence and passion is on display in the comments section. Beyond our success influencing the mainstream narrative, we have also worked behind the scenes to help advocates get real change on the streets. That’s why the San Francisco Bicycle Coalition honored us with a Golden Wheel Award last year. Accepting the award, and giving a speech before hundreds of movers and shakers in the bike movement, was one of my proudest moments as the editor of Streetsblog San Francisco. The outreach and relationships we maintained was key. We were definitely not producing just a blog. Combined with our national coverage from Sarah Goodyear and Angie Schmitt at the Streetsblog Network and Tanya Snyder at Streetsblog D.C., Damien Newton’s tireless work at Streetsblog L.A. and the steady stream of wonderful Streetfilms (from transportation super heroes Clarence Eckerson, Elizabeth Press and Robin Smith in New York, and by our local filmmaking genius John Hamilton), we produced what I think became the most prominent sustainable transportation news site in the Bay Area. I owe a great deal of thanks to all of you. You are part of my success story. There’s no way I could have done this without you. Thank you for coming back to the blog every day and donating when we needed it most. OpenPlans, the parent non-profit of Streetsblog, is committed to keeping the blog going, and my colleague Ben Fried in New York will have a separate post on the future of Streetsblog San Francisco. I’m going to miss all of you, but I take pride in the fact that Streetsblog San Francisco flourished under my leadership, and that I had a good run. Sorry to see you step down Bryan. You really put this blog on the map and I relied on it for many stories over the years. Good luck on your next steps and I’m sure — in part because of the foundation you’ve built — the site will remain an important livable streets news source. I loved working with Bryan, just having such an accomplished veteran journalist on the team made all of us, especially me, such a better writer. Best wishes for your future endeavors. I’ve enjoyed reading your posts and have been inspired. Thank you for everything, Bryan. oh no! I’m sorry to hear you’re leaving! Good luck in the next gig, and you did a great job here and should be proud of your work. I am concerned now. First because Bryan has been a great reporter, but second – hearing about the future of Streetsblog SF from someone in NY is not reassuring. I hope Streetsblog SF survives because it is badly needed. Bryan, you’ve poured your heart and soul into this blog for almost three years. You’re a consummate pro, a great reporter, and it’s been incredibly rewarding to work with you. Your impact as Streetsblog SF editor speaks to your belief in the potential for a more livable city and dedication to good journalism, as do all the improvements to the streets of your city in the past couple of years. Streetsblog is going to miss you. To all the Streetsblog SF readers: From 3,000 miles away, it’s easy to see that the livable streets community in the Bay Area is strong and vibrant every time I read a post or a comment thread here. With Bryan leaving, we’ve got some big shoes to fill, and Streetsblog and OpenPlans are committed to maintaining the high-quality content you’ve come to expect. Stay tuned — I’ll have an update later today on our transition plans. SO proud of what you have done and what you accomplished. At times it was not easy for you but you pursued because of your passion for what you do best. You inspired me and helped me see that any thing is possible if you believe and pursue…I know that you will succeed at whatever you do cause YOU ARE THE BEST…. Sad to see you go, Bryan. I appreciate the work you, Matthew and other Streetsblog folks have done to boost coverage and discussion of transportation issues, and will miss the competition. Thank you, Bryan, for your enthusiasm and dedication, and best of luck in your upcoming pursuits. Thank you Bryan. You’ve made Streetsblog SF a special place for everyone to take another look at their daily grind. Whatever happens to SB SF, you’ve left a lasting legacy in a community of readers and commentators. I hope to catch you on your bike on our improving streets. You’ve done incredible and important work here. Thank you for your contributions especially your hard work to bring to light the deaths & injuries on our roads. Crikey! This sort of news jumps up when you least expect it. I’m sorry to see you go Bryan. You have been an a strong advocate for smart planning & transit. San Francisco is a better place because of your work. I wish you well in your future pursuits and hope that we will still hear your voice around SF. Bryan, thank you for all your good works. StreetsblogSF has been informative, inspirational and fun. Best wishes to you in the future. Huge thanks to you, Bryan, for your passion, commitment, and courage. You vaulted the livability conversation forward — from studies on the shelves to real change on the streets and sidewalks. You advanced the state of journalism in the Bay Area and beyond and resisted the easy and superficial reporting that sometimes engulfs us. You gave us a voice and encouraged us to find our own. You and Streetsblog SF has given us all a standout performance. Thank you. Take a good break and find a way to come back with something new keep us all moving toward a more livable city. Sorry to hear your leaving Bryan. This blog is one of my most trusted and interesting sources for keeping up to speed on events in SF, even around the country. I’m really bummed you’re leaving, and wish you the best of luck wherever you end up. Thanks for all the great reporting. However, I echo concerns of others that the future plans for Streetsblog SF sound somewhat ominous. I really hope it stays as strong as it has been under Bryan, Matthew Roth, and others who have made it what it has become over the past few years …. Thanks for your great work Bryan. You’ll be missed here, but see you in the streets! I wish to thank you as well. For this reader, the local reporting had the greatest appeal and I hope that someone else will be able to follow in your footsteps. Good luck to you. Thanks, Bryan, for all your hard work and dedication. I hope we’ll still see you riding around town! Thanks for all of your hard work, Bryan! It’s been wonderful following your work on this blog, and whoever comes next has some big shoes to fill! I’m sad to hear this news. Bryan, in your time as editor of Streetsblog San Francisco you’ve shown intelligence, integrity, tenacity, vision, and courage, qualities rare enough that I mourn to see them go. I wish you success in your new endeavors and am doing my best to be hopeful that Streetsblog will continue to advance the dialogue about livable communities both in San Francisco and the nation. You’re a class act, Bryan. You’ll be missed. 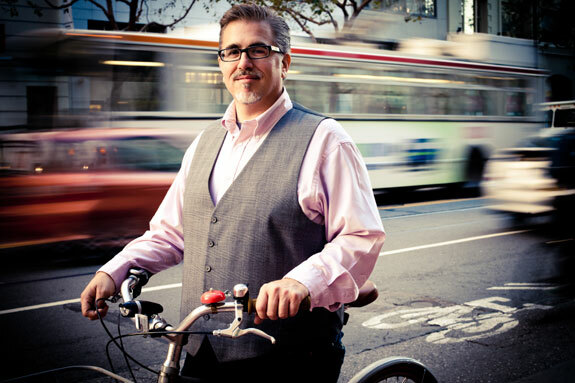 Bryan, thank you for a job well done with Streetsblog over the past few years. You have constantly highlighted and presented great newsworthy articles for this city. This site has been invaluable for keeping up with all news and events related to the fair use of our public ways. You have left behind some very large shoes to fill. Thank you, and best of luck. Thank you Bryan, and good luck. Alas and boo-hoo, but hip-hooray for Bryan Goebel, you really got this thing spinning, what a very good thing — thanks for the great ride! Thank you — you’ve made a big difference. I’m speechless. Bryan, I don’t know what we’re going to do without you!! I hope whatever you’re moving towards is wonderful, because you really, really deserve it. So sorry to see you go, after seeing you EVERYWHERE these past couple of years. I knew I was where I needed to be when you were on the scene. Thanks for your daily chronical on SFs journey to becoming the premier city for cycling. We’re going to do it! Thank you everyone for your kind words. I’m going to miss my job at Streetsblog, but am excited about the future!